Our policy at Mindful-Way has always been not to turn anyone away due to lack of funds to our programs and retreats. This serves our commitment to our core values of diversity and inclusiveness. However our programs, especially our residential multi-night retreats have quite an overhead ! So what to do? We’re a small organization with no external funding. Here is what we discovered over the years, people are naturally generous!! (Actually we already knew that!). But we got to see it demonstrated. You see, while for some folks it is quite a stretch to carve out the time, child care and money for retreats -which is so important in our lives today more than ever… others are in a position where it is very comfortably affordable. And when these folks have a meaningful transformative experience which they do, they then want to make it possible for others to have this opportunity that might not have the funds. So it’s our participants who created our scholarship fund and it has worked beautifully! Generosity, loving kindness, and compassion are natural seeds within us that bloom forth in the nourishing soil of retreat. This January we had a lovely family of four join us. During the first meal of the retreat which is not silent, I started chatting with them. I asked, “Is this the whole gang?” They answered, “Not quite, we lost our eldest son Alvaro last year, but we feel he is here with us. He brought us here.” I was deeply moved. The family practiced and participated whole heartedly in everything. Hugh and I connected with them during small groups and individual interviews and feel they were indeed our teachers. 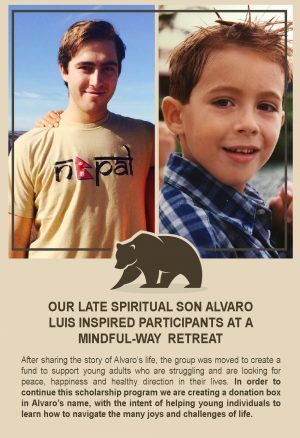 In the closing circle of the program, they shared how the loss of Alvaro was shaping their lives and their commitment to practice, to help others and what the retreat had done for them as a family. Shortly after that I received a note from a young woman attorney which read, “I would like to donate a full scholarship in honor of Alvaro Luis.” Keeping her anonymity, I shared this with the group who wanted to join her and hence the birth of the Alvaro Luis Scholarship Fund. We use these funds for anyone in need and particularly focus on young folks and people of diverse populations. If you’d like to contribute to making retreats possible for everyone, please donate below by Credit Card.